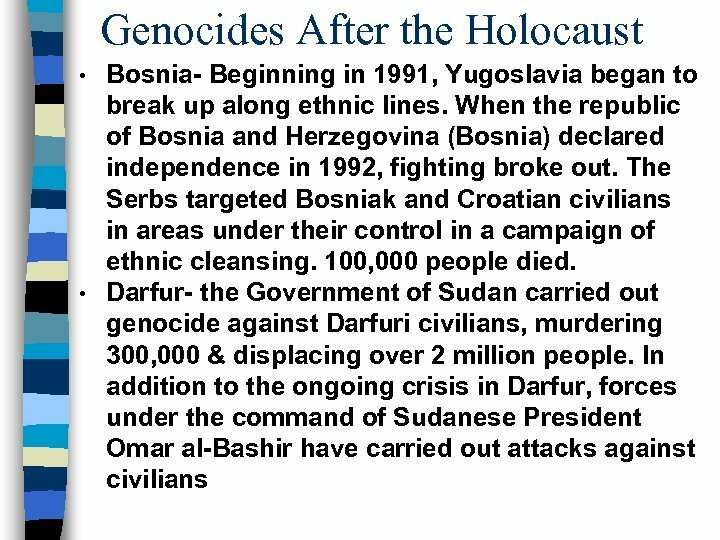 Genocide n The deliberate killing of a large group of people, especially those of a particular ethnic group or nation. 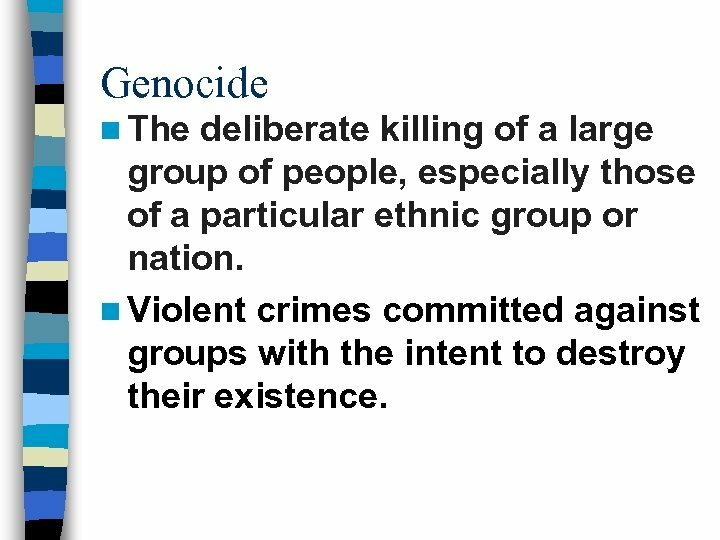 n Violent crimes committed against groups with the intent to destroy their existence. 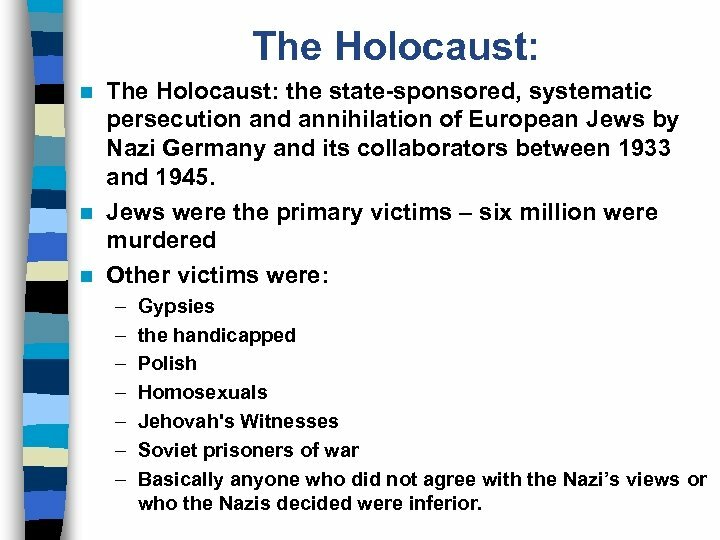 The Holocaust: the state-sponsored, systematic persecution and annihilation of European Jews by Nazi Germany and its collaborators between 1933 and 1945. n Jews were the primary victims – six million were murdered n Other victims were: n – – – – Gypsies the handicapped Polish Homosexuals Jehovah's Witnesses Soviet prisoners of war Basically anyone who did not agree with the Nazi’s views or who the Nazis decided were inferior. 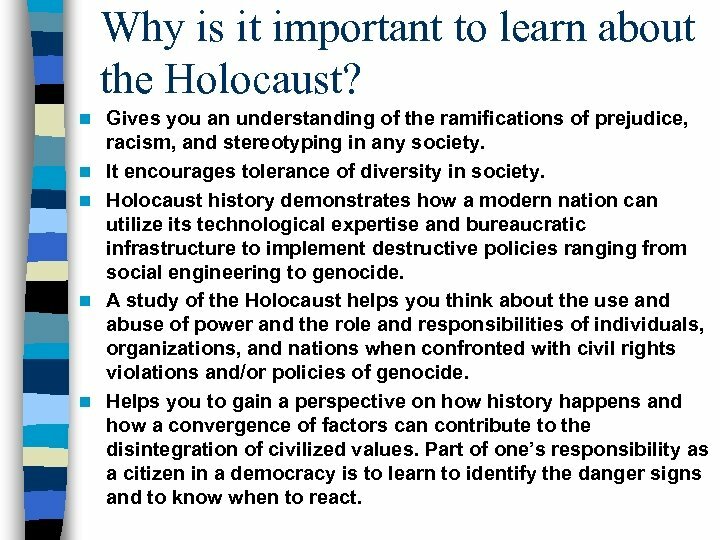 Why is it important to learn about the Holocaust? n n n Gives you an understanding of the ramifications of prejudice, racism, and stereotyping in any society. It encourages tolerance of diversity in society. 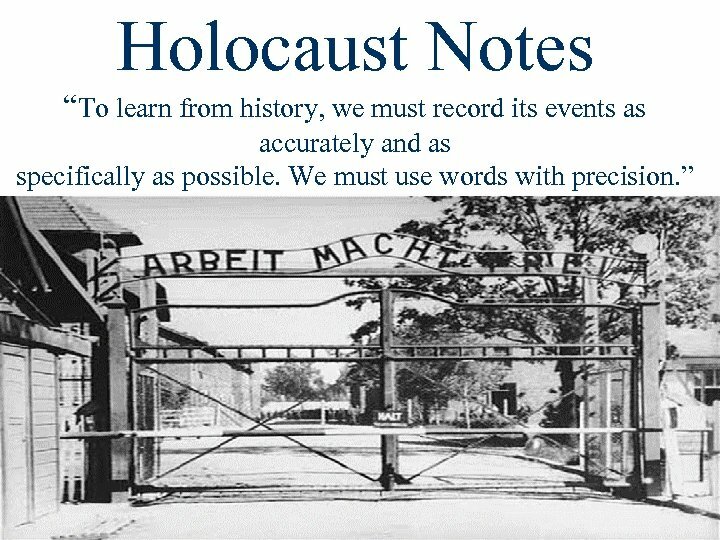 Holocaust history demonstrates how a modern nation can utilize its technological expertise and bureaucratic infrastructure to implement destructive policies ranging from social engineering to genocide. 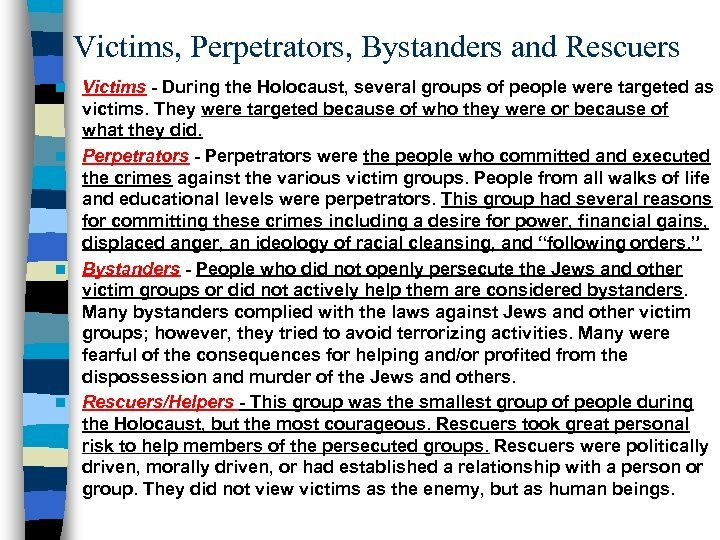 A study of the Holocaust helps you think about the use and abuse of power and the role and responsibilities of individuals, organizations, and nations when confronted with civil rights violations and/or policies of genocide. Helps you to gain a perspective on how history happens and how a convergence of factors can contribute to the disintegration of civilized values. Part of one’s responsibility as a citizen in a democracy is to learn to identify the danger signs and to know when to react. 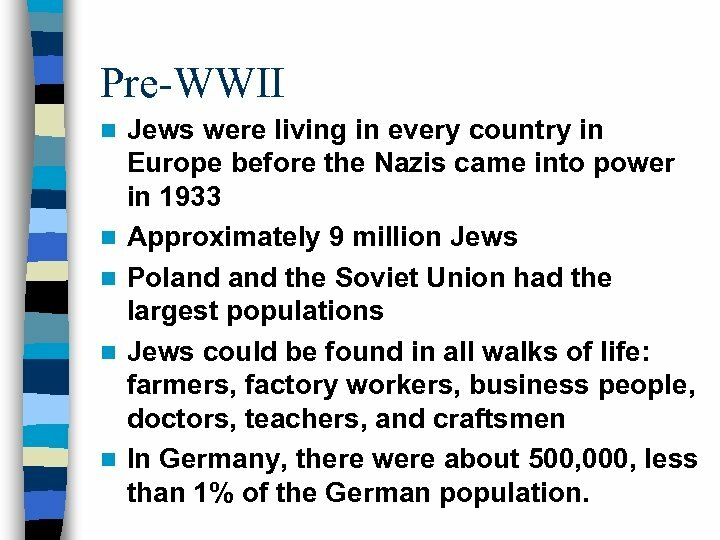 Pre-WWII n n n Jews were living in every country in Europe before the Nazis came into power in 1933 Approximately 9 million Jews Poland the Soviet Union had the largest populations Jews could be found in all walks of life: farmers, factory workers, business people, doctors, teachers, and craftsmen In Germany, there were about 500, 000, less than 1% of the German population. 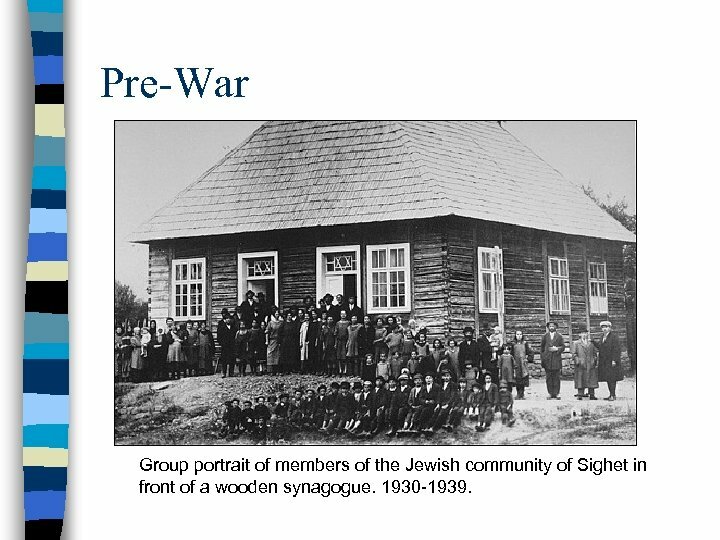 Pre-War Group portrait of members of the Jewish community of Sighet in front of a wooden synagogue. 1930 -1939. 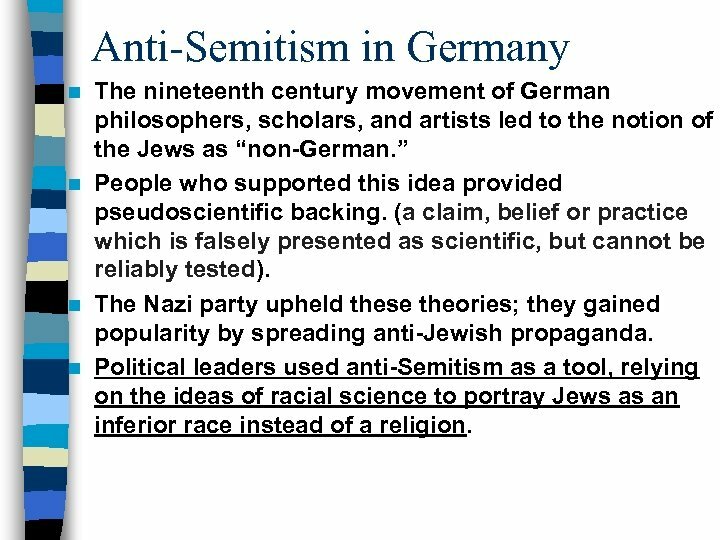 Anti-Semitism n Definition: prejudice against, hatred of, or discrimination against Jews as a national, ethnic, religious or racial group. 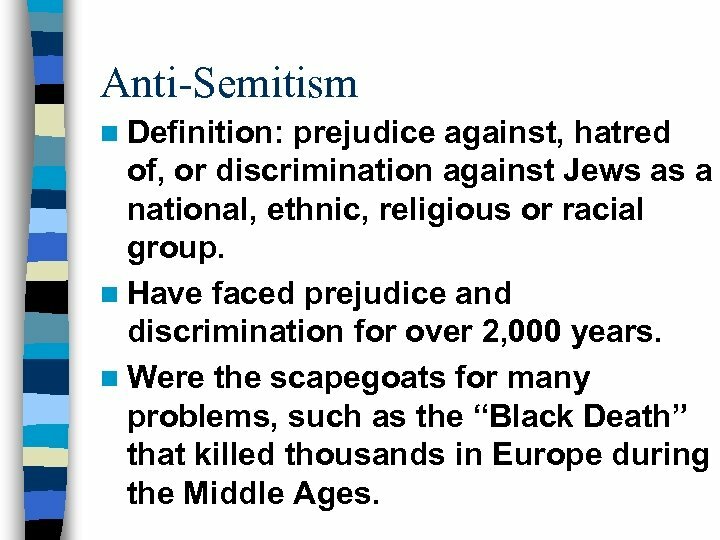 n Have faced prejudice and discrimination for over 2, 000 years. n Were the scapegoats for many problems, such as the “Black Death” that killed thousands in Europe during the Middle Ages. 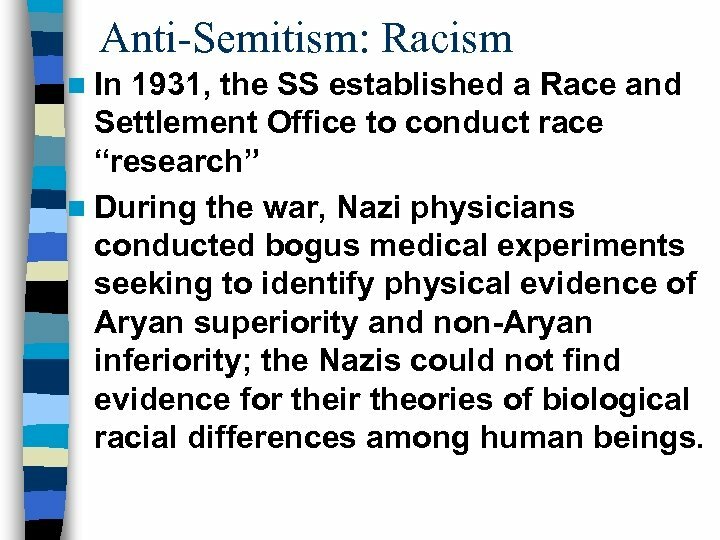 Anti-Semitism: Racism n In 1931, the SS established a Race and Settlement Office to conduct race “research” n During the war, Nazi physicians conducted bogus medical experiments seeking to identify physical evidence of Aryan superiority and non-Aryan inferiority; the Nazis could not find evidence for their theories of biological racial differences among human beings. 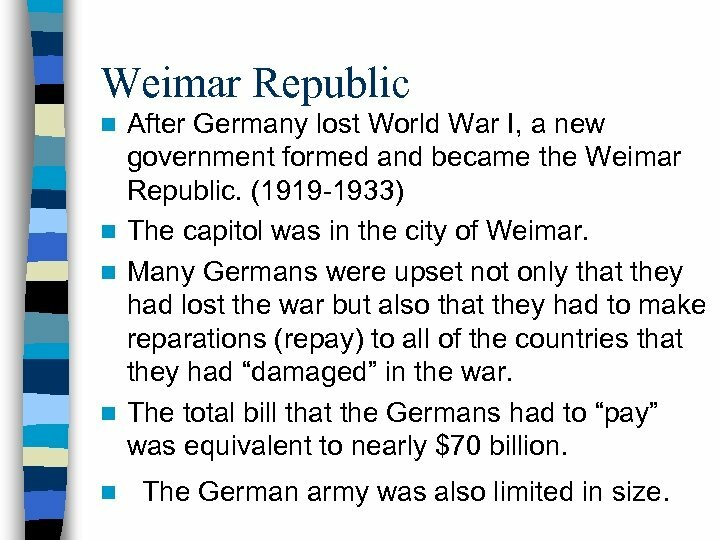 Weimar Republic After Germany lost World War I, a new government formed and became the Weimar Republic. (1919 -1933) n The capitol was in the city of Weimar. n Many Germans were upset not only that they had lost the war but also that they had to make reparations (repay) to all of the countries that they had “damaged” in the war. 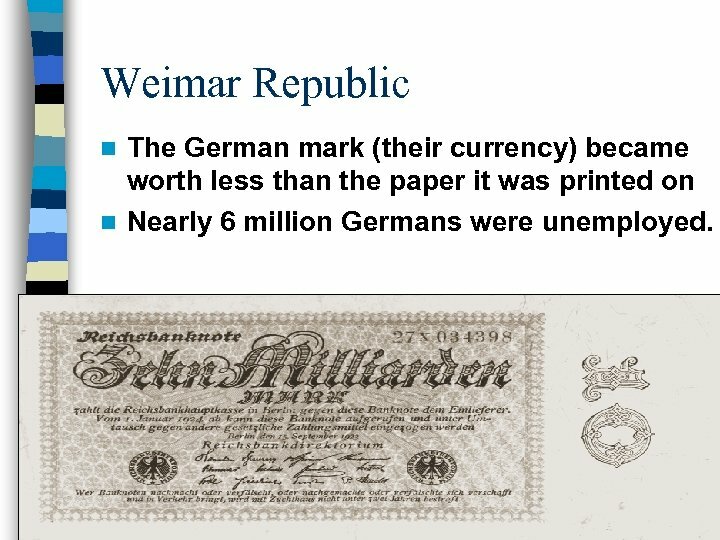 n The total bill that the Germans had to “pay” was equivalent to nearly $70 billion. n n The German army was also limited in size. 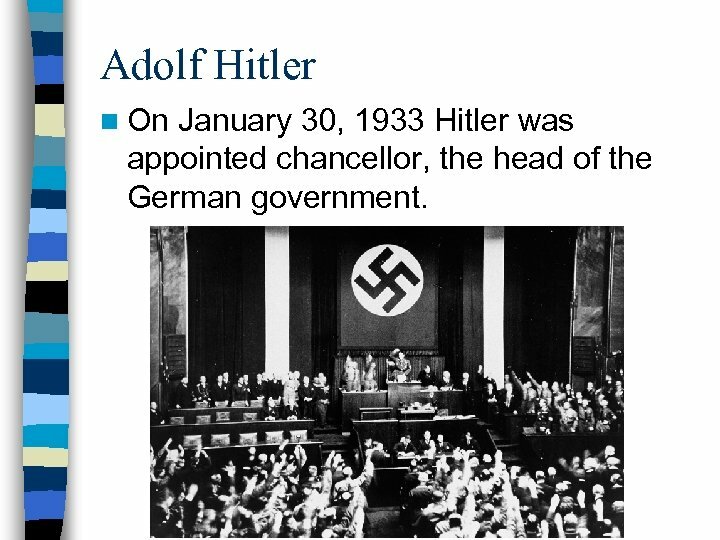 Adolf Hitler n On January 30, 1933 Hitler was appointed chancellor, the head of the German government. 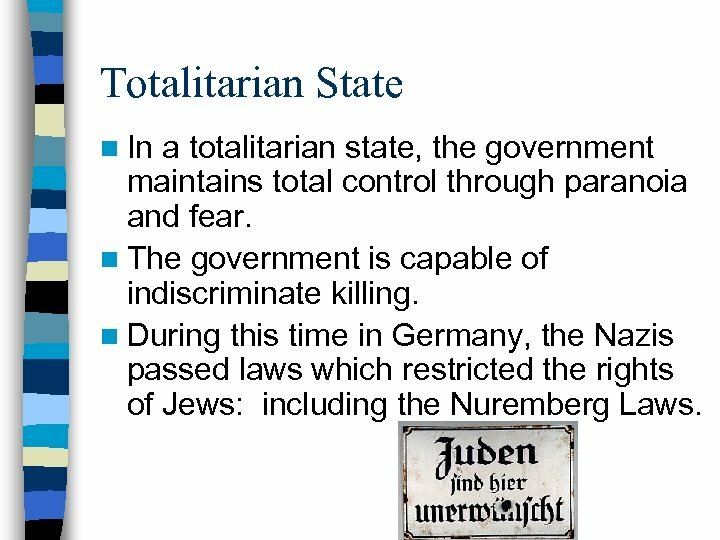 Totalitarian State n In a totalitarian state, the government maintains total control through paranoia and fear. n The government is capable of indiscriminate killing. 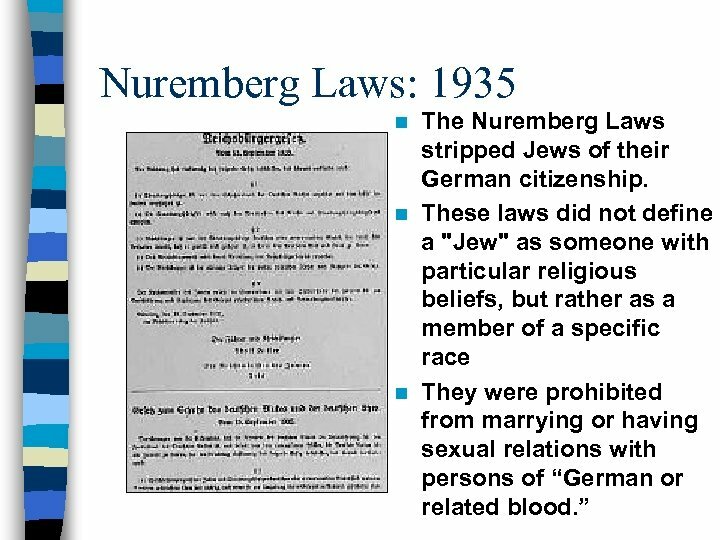 n During this time in Germany, the Nazis passed laws which restricted the rights of Jews: including the Nuremberg Laws. 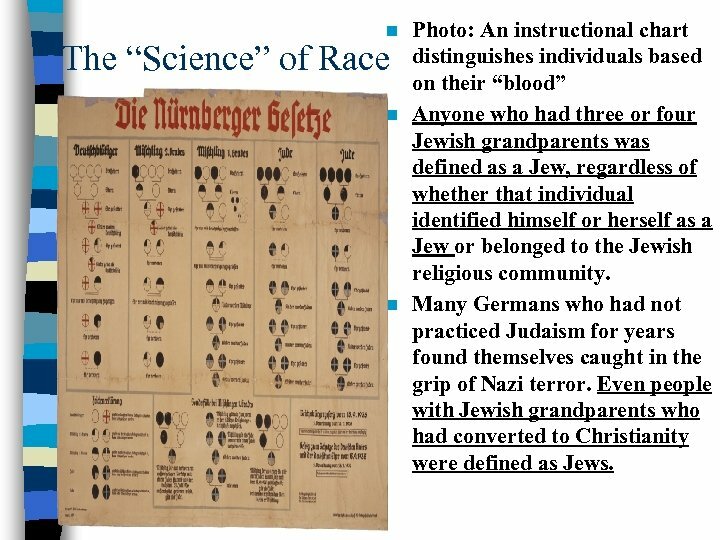 The Aryan Race The Nazis divided the world’s population into superior and inferior “races. 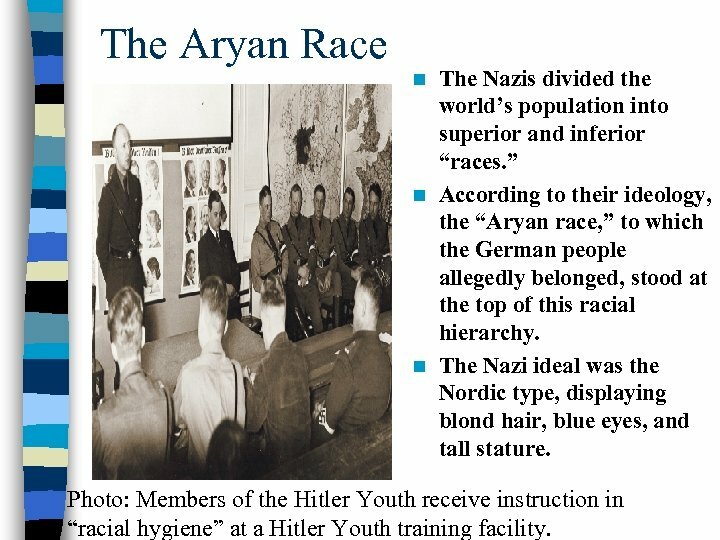 ” n According to their ideology, the “Aryan race, ” to which the German people allegedly belonged, stood at the top of this racial hierarchy. 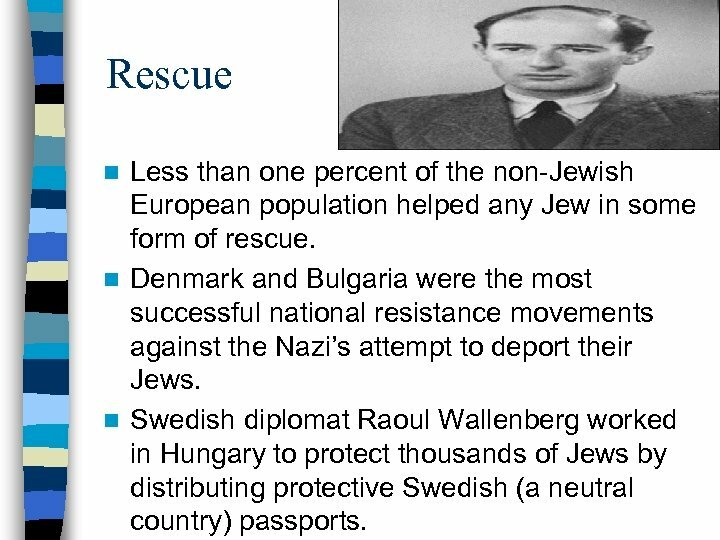 n The Nazi ideal was the Nordic type, displaying blond hair, blue eyes, and tall stature. n Photo: Members of the Hitler Youth receive instruction in “racial hygiene” at a Hitler Youth training facility. 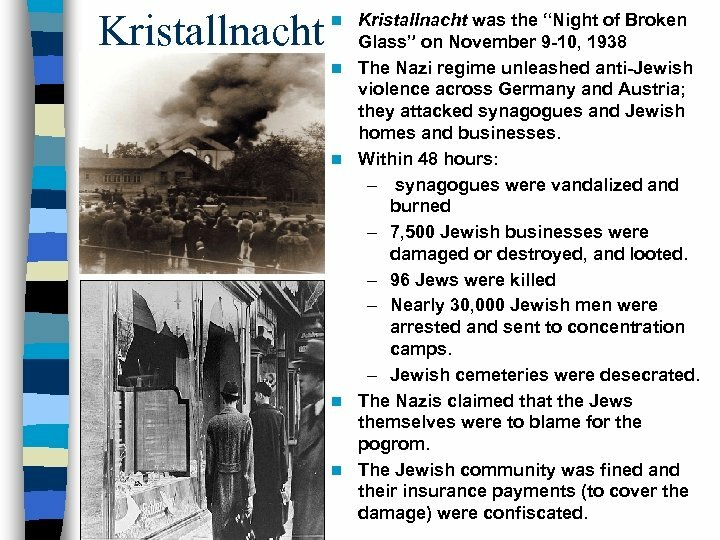 Kristallnacht n n n Kristallnacht was the “Night of Broken Glass” on November 9 -10, 1938 The Nazi regime unleashed anti-Jewish violence across Germany and Austria; they attacked synagogues and Jewish homes and businesses. Within 48 hours: – synagogues were vandalized and burned – 7, 500 Jewish businesses were damaged or destroyed, and looted. 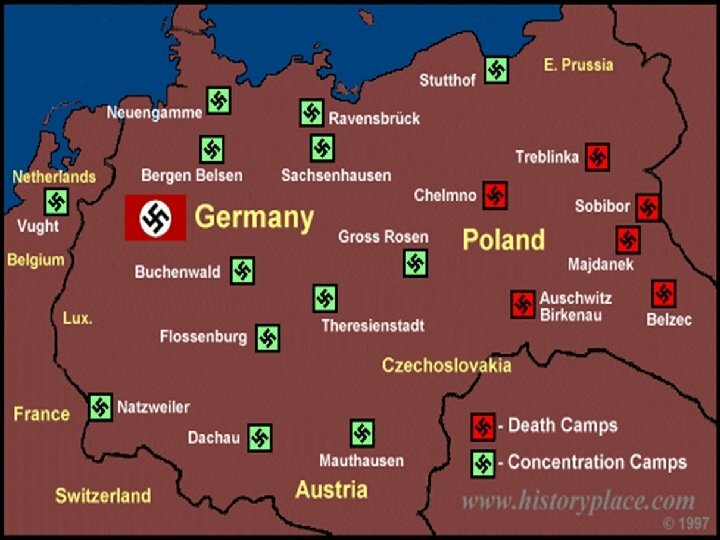 – 96 Jews were killed – Nearly 30, 000 Jewish men were arrested and sent to concentration camps. – Jewish cemeteries were desecrated. 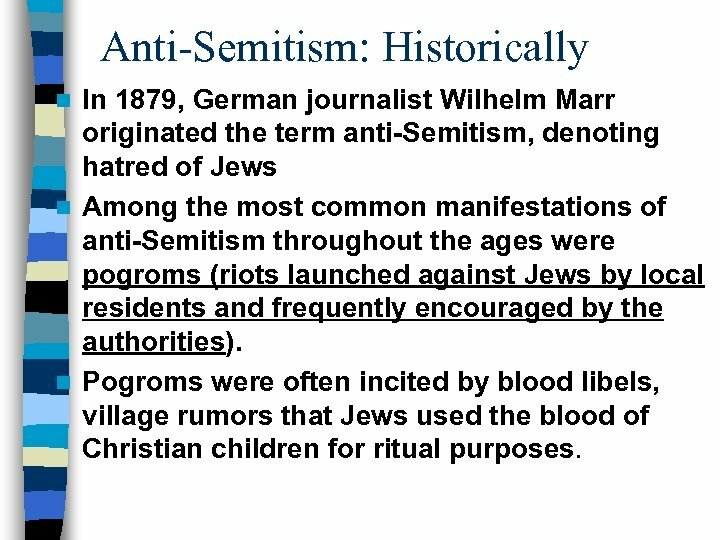 The Nazis claimed that the Jews themselves were to blame for the pogrom. The Jewish community was fined and their insurance payments (to cover the damage) were confiscated. 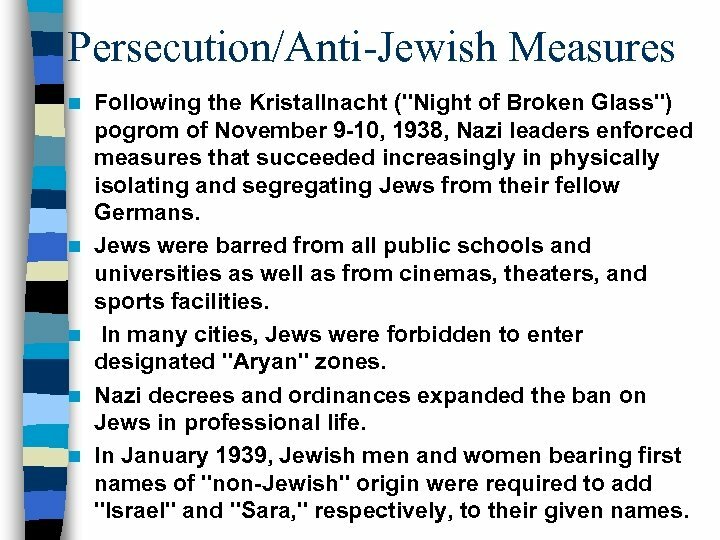 Persecution/Anti-Jewish Measures n n n Following the Kristallnacht ("Night of Broken Glass") pogrom of November 9 -10, 1938, Nazi leaders enforced measures that succeeded increasingly in physically isolating and segregating Jews from their fellow Germans. Jews were barred from all public schools and universities as well as from cinemas, theaters, and sports facilities. 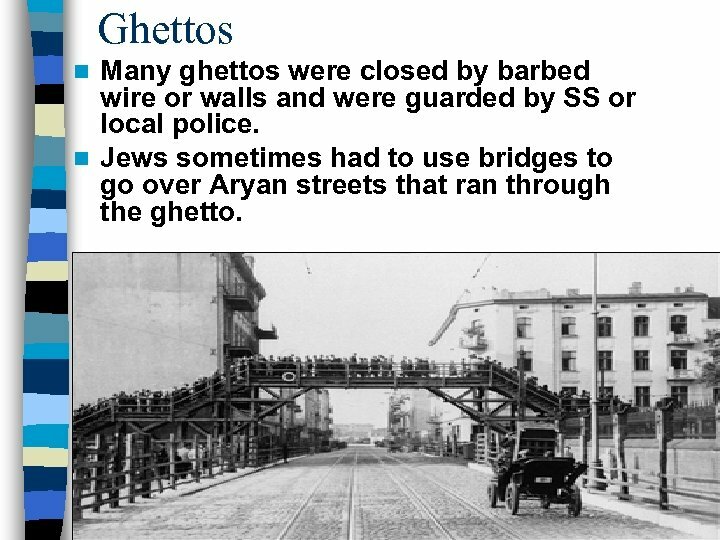 In many cities, Jews were forbidden to enter designated "Aryan" zones. 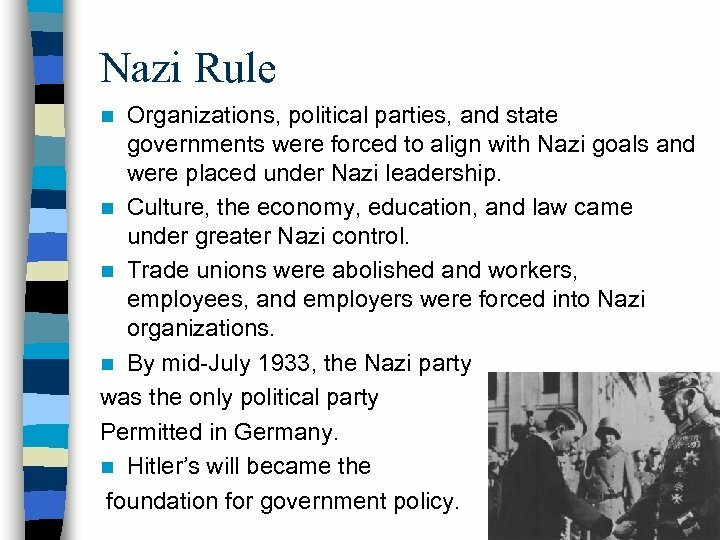 Nazi decrees and ordinances expanded the ban on Jews in professional life. In January 1939, Jewish men and women bearing first names of "non-Jewish" origin were required to add "Israel" and "Sara, " respectively, to their given names. 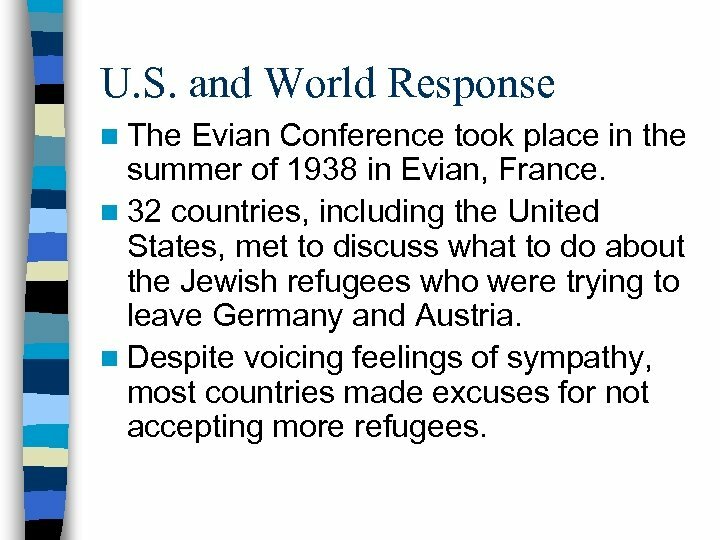 U. S. and World Response n The Evian Conference took place in the summer of 1938 in Evian, France. 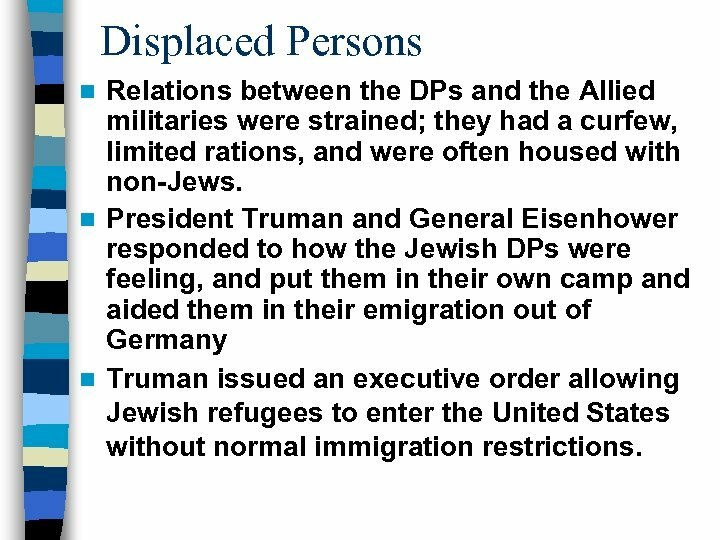 n 32 countries, including the United States, met to discuss what to do about the Jewish refugees who were trying to leave Germany and Austria. n Despite voicing feelings of sympathy, most countries made excuses for not accepting more refugees. 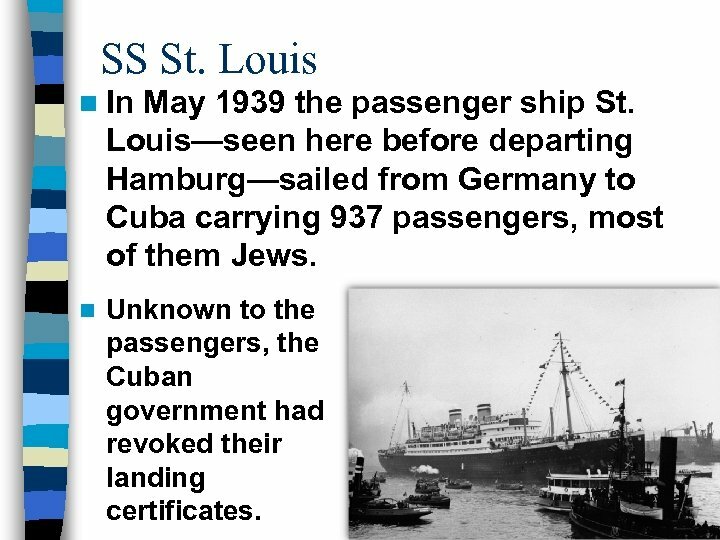 SS St. Louis n In May 1939 the passenger ship St. Louis—seen here before departing Hamburg—sailed from Germany to Cuba carrying 937 passengers, most of them Jews. n Unknown to the passengers, the Cuban government had revoked their landing certificates. Ghettos n Life in the ghettos was hard. n Food was rationed; people often starved. n Several families often shared a small space n Disease spread rapidly due to unsanitary conditions. 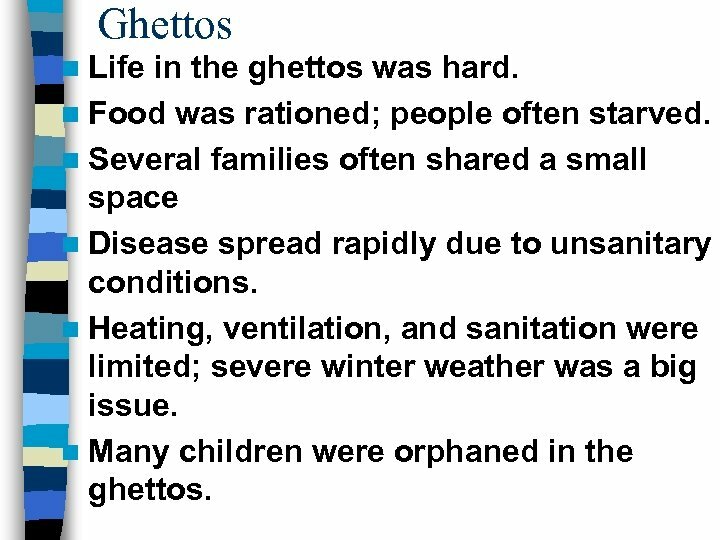 n Heating, ventilation, and sanitation were limited; severe winter weather was a big issue. 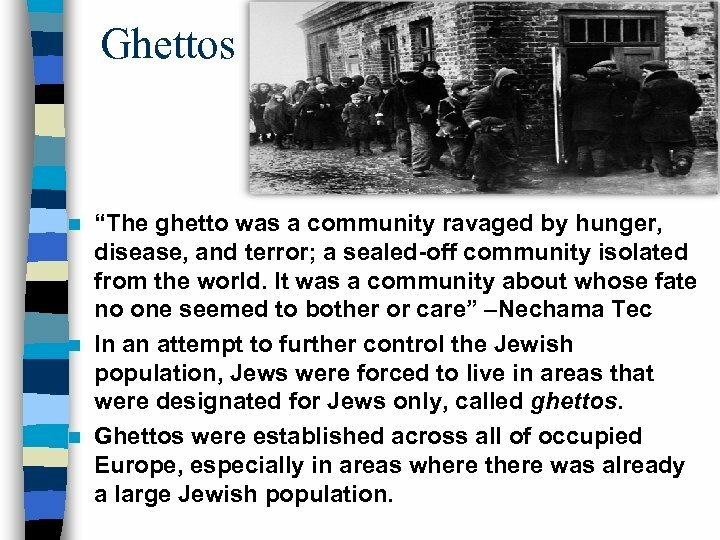 n Many children were orphaned in the ghettos. 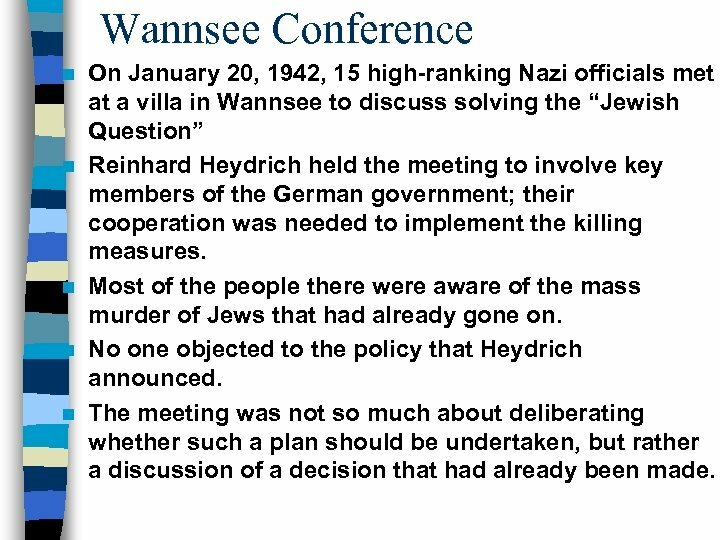 Wannsee Conference n n n On January 20, 1942, 15 high-ranking Nazi officials met at a villa in Wannsee to discuss solving the “Jewish Question” Reinhard Heydrich held the meeting to involve key members of the German government; their cooperation was needed to implement the killing measures. 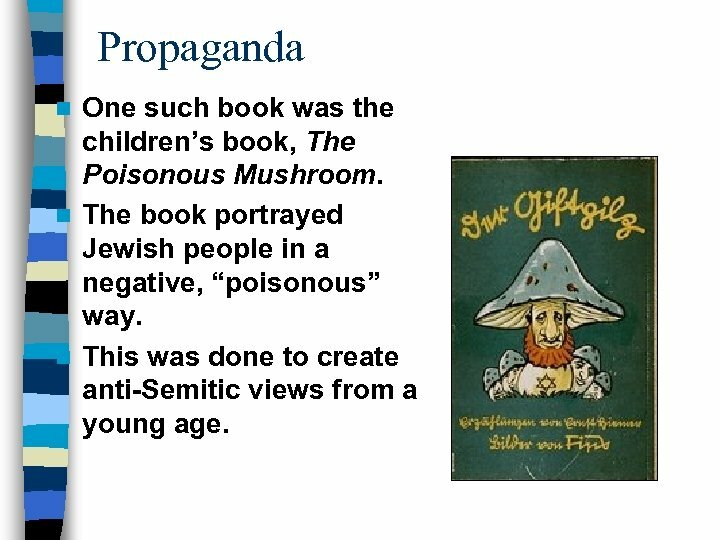 Most of the people there were aware of the mass murder of Jews that had already gone on. 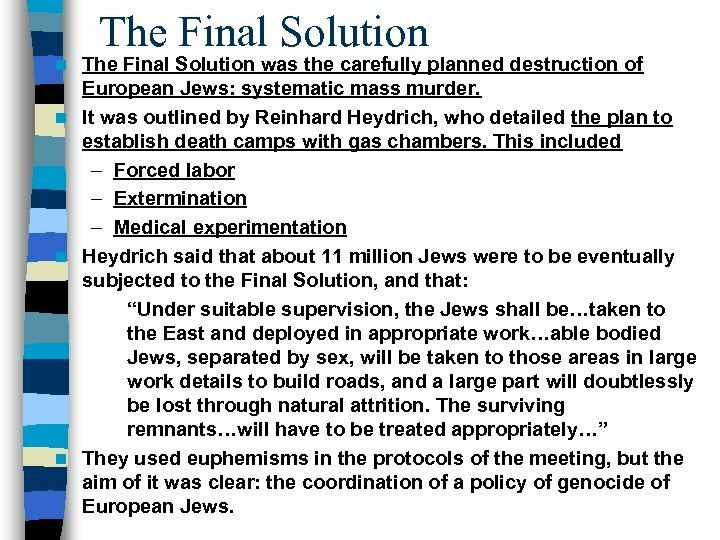 No one objected to the policy that Heydrich announced. The meeting was not so much about deliberating whether such a plan should be undertaken, but rather a discussion of a decision that had already been made. 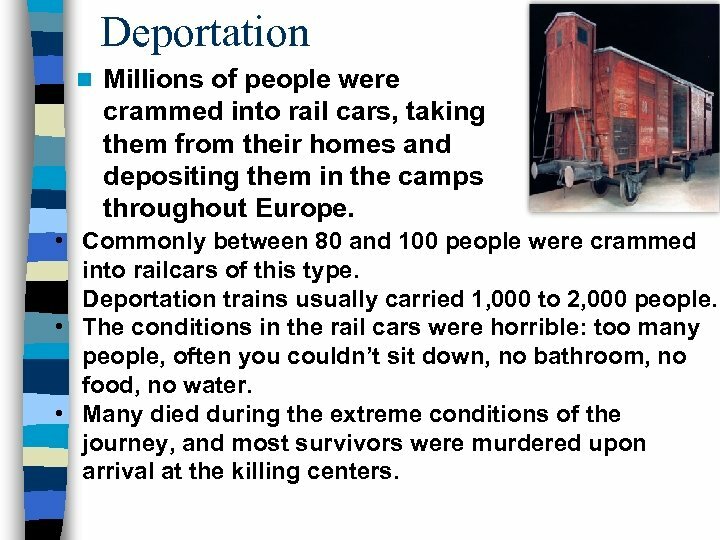 Deportation n Millions of people were crammed into rail cars, taking them from their homes and depositing them in the camps throughout Europe. • Commonly between 80 and 100 people were crammed into railcars of this type. • Deportation trains usually carried 1, 000 to 2, 000 people. • The conditions in the rail cars were horrible: too many people, often you couldn’t sit down, no bathroom, no food, no water. 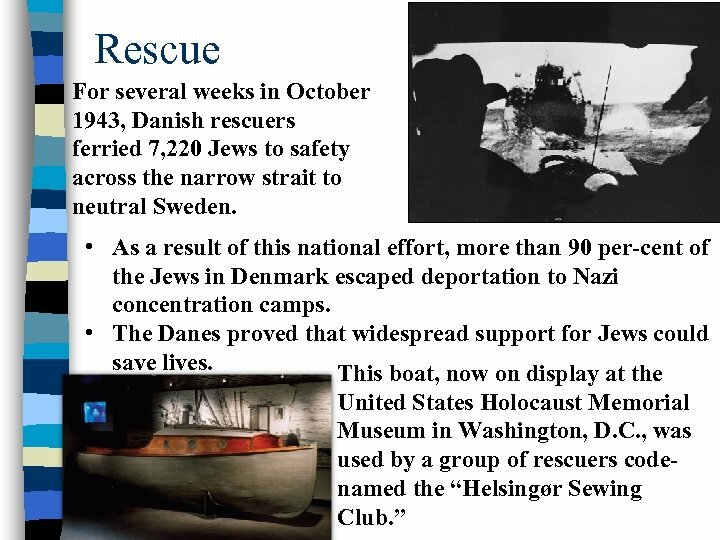 • Many died during the extreme conditions of the journey, and most survivors were murdered upon arrival at the killing centers. 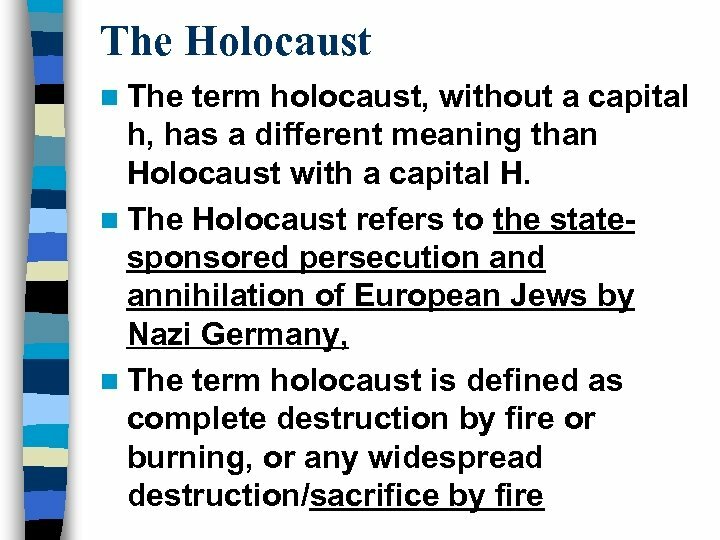 Death Camps n n n Death camps were the means the Nazis used to achieve the “final solution. ” Their purpose was one thing: mass murder. 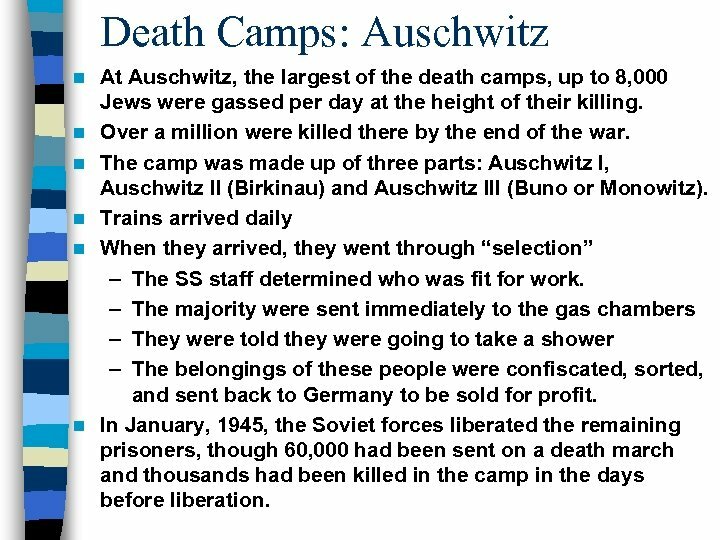 There were six death camps: Auschwitz-Birkenau, Treblinka, Chelmno, Sobibor, Majdanek, and Belzec. 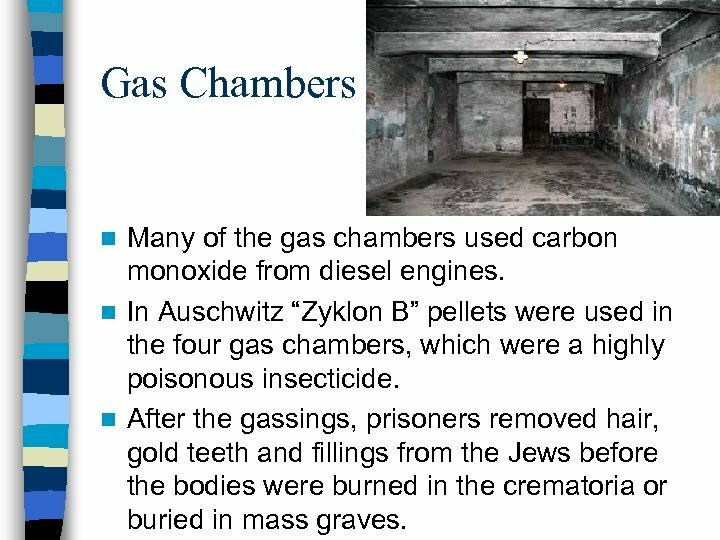 Each used gas chambers to murder the Jews. 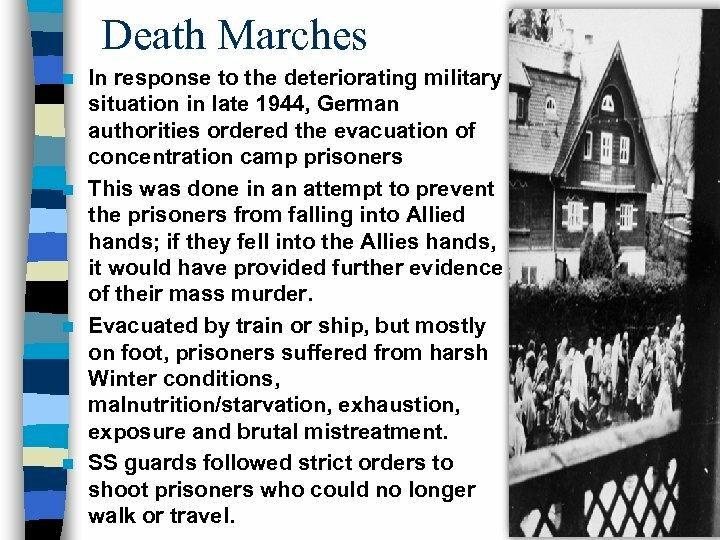 Almost all deportees who arrived at the camps were sent immediately to the gas chambers; a small number were chosen for special work. 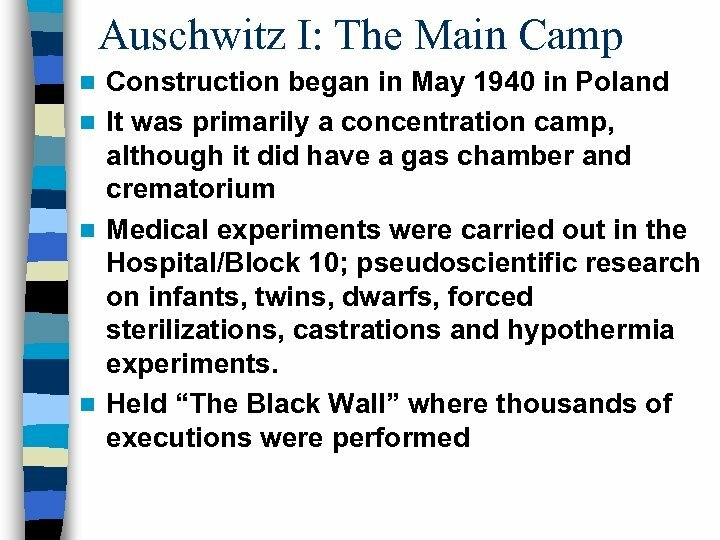 Death Camps: Auschwitz n n n At Auschwitz, the largest of the death camps, up to 8, 000 Jews were gassed per day at the height of their killing. Over a million were killed there by the end of the war. 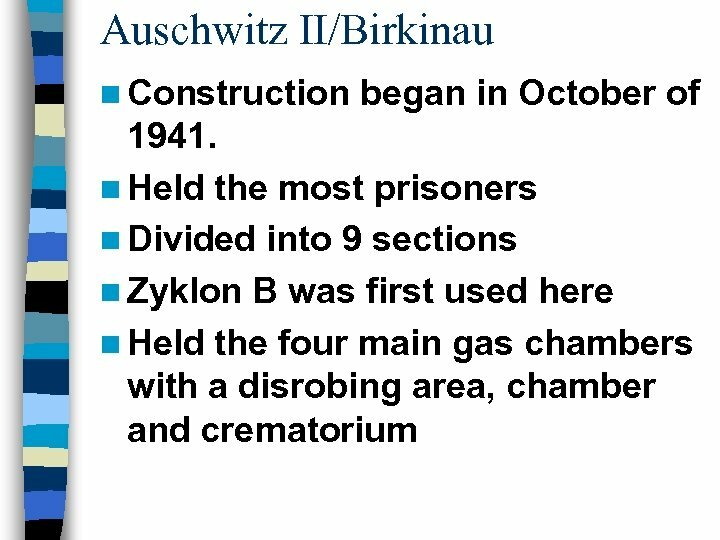 The camp was made up of three parts: Auschwitz I, Auschwitz II (Birkinau) and Auschwitz III (Buno or Monowitz). Trains arrived daily When they arrived, they went through “selection” – The SS staff determined who was fit for work. 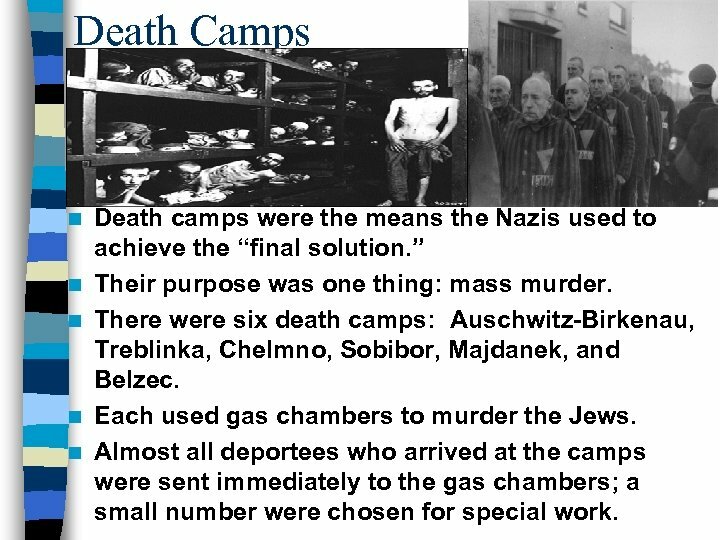 – The majority were sent immediately to the gas chambers – They were told they were going to take a shower – The belongings of these people were confiscated, sorted, and sent back to Germany to be sold for profit. 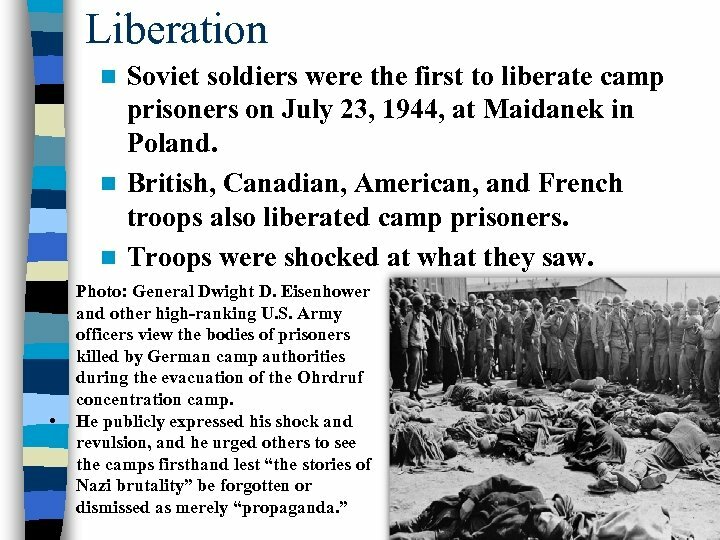 In January, 1945, the Soviet forces liberated the remaining prisoners, though 60, 000 had been sent on a death march and thousands had been killed in the camp in the days before liberation. 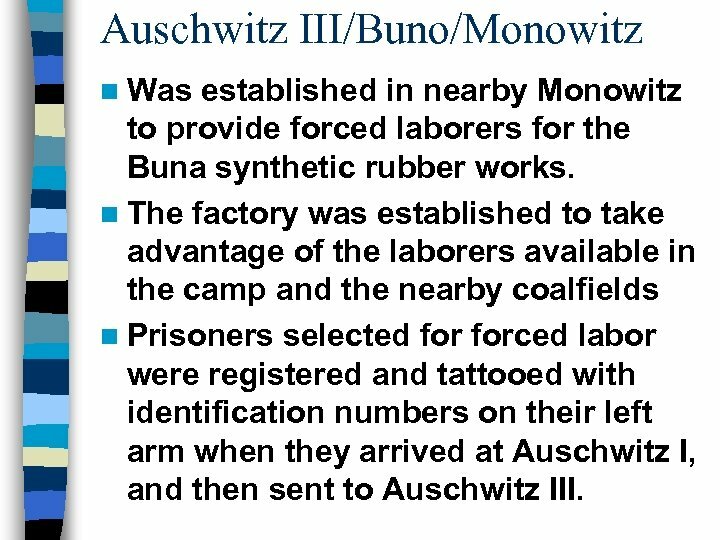 Auschwitz III/Buno/Monowitz n Was established in nearby Monowitz to provide forced laborers for the Buna synthetic rubber works. 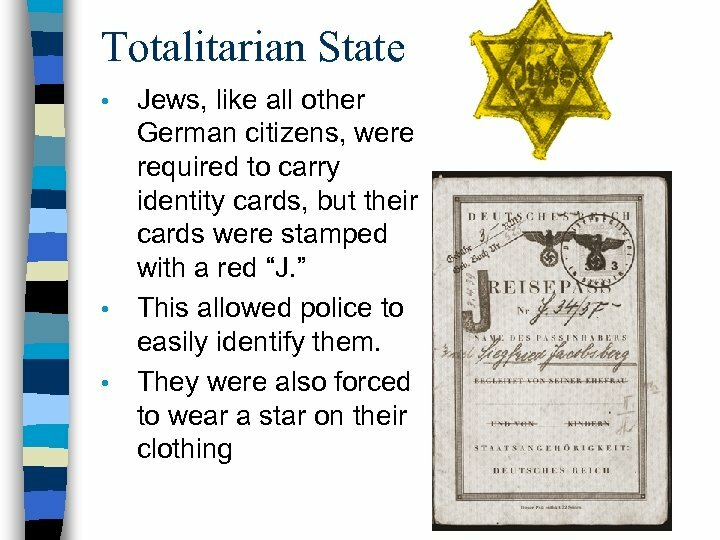 n The factory was established to take advantage of the laborers available in the camp and the nearby coalfields n Prisoners selected forced labor were registered and tattooed with identification numbers on their left arm when they arrived at Auschwitz I, and then sent to Auschwitz III. Labor Camps n At the forced labor camps, the focus was not to just exterminate prisoners. The focus was having them work. n The Nazis believed that hard manual labor was not only a means of punishing intellectual opponents, but also of “educating” them. 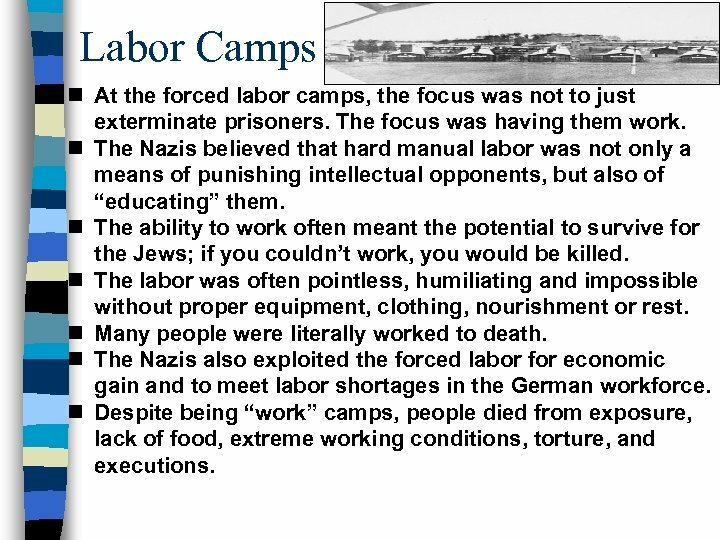 n The ability to work often meant the potential to survive for the Jews; if you couldn’t work, you would be killed. n The labor was often pointless, humiliating and impossible without proper equipment, clothing, nourishment or rest. n Many people were literally worked to death. 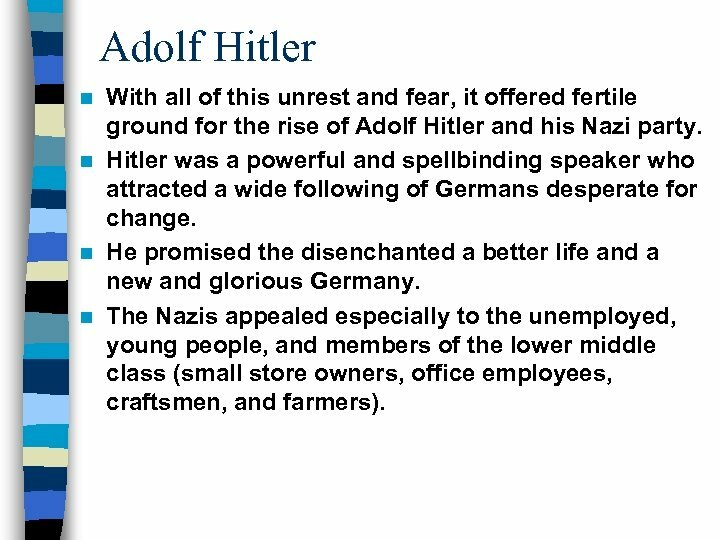 n The Nazis also exploited the forced labor for economic gain and to meet labor shortages in the German workforce. 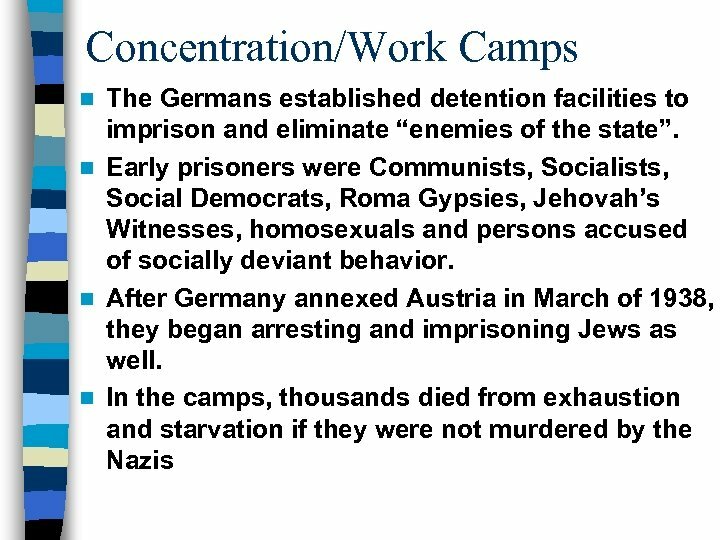 n Despite being “work” camps, people died from exposure, lack of food, extreme working conditions, torture, and executions. 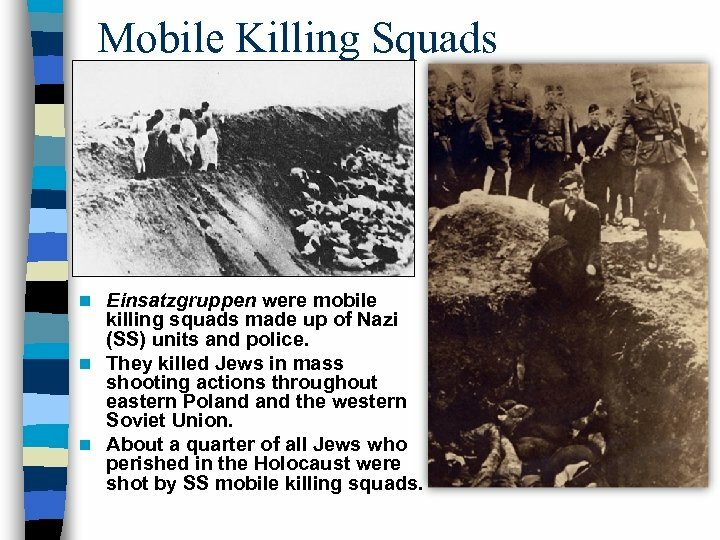 Jewish Resistance n At Sobibor and Treblinka, concentration camps, prisoners stole weapons and attacked the guards. n Most of them were shot, though several dozen prisoners escaped. 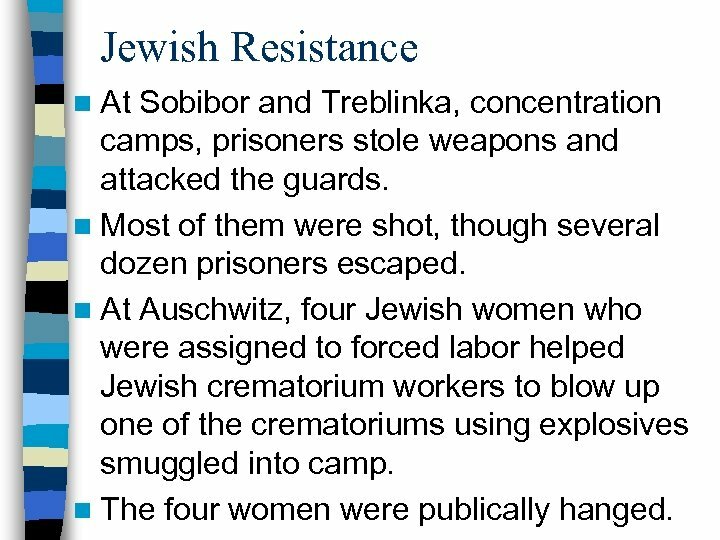 n At Auschwitz, four Jewish women who were assigned to forced labor helped Jewish crematorium workers to blow up one of the crematoriums using explosives smuggled into camp. n The four women were publically hanged. 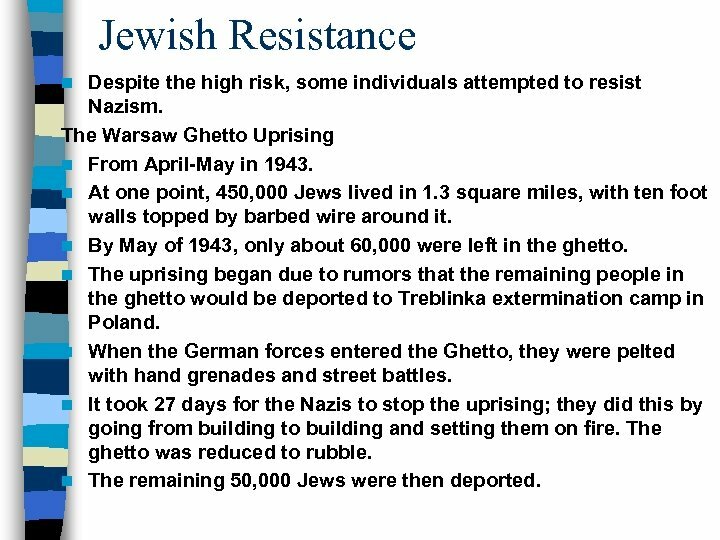 Non-Jewish Resistance n n n The “White Rose” movement protested Nazism, though not Jewish policy, in Germany. 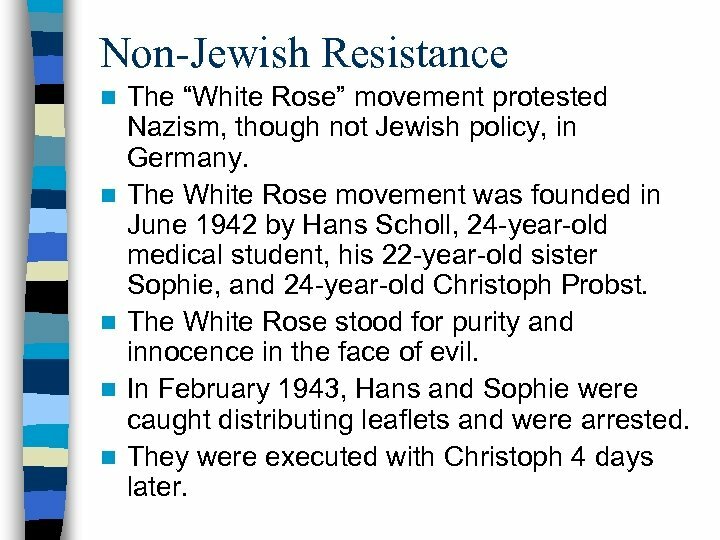 The White Rose movement was founded in June 1942 by Hans Scholl, 24 -year-old medical student, his 22 -year-old sister Sophie, and 24 -year-old Christoph Probst. The White Rose stood for purity and innocence in the face of evil. In February 1943, Hans and Sophie were caught distributing leaflets and were arrested. They were executed with Christoph 4 days later. 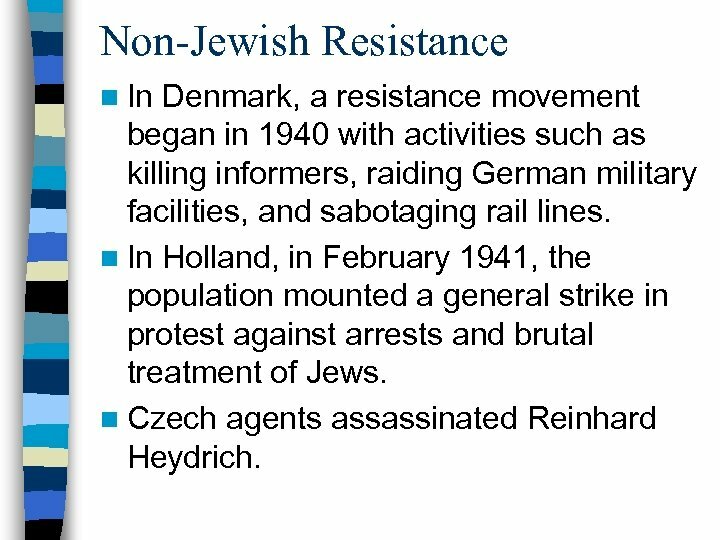 Non-Jewish Resistance n In Denmark, a resistance movement began in 1940 with activities such as killing informers, raiding German military facilities, and sabotaging rail lines. n In Holland, in February 1941, the population mounted a general strike in protest against arrests and brutal treatment of Jews. n Czech agents assassinated Reinhard Heydrich. 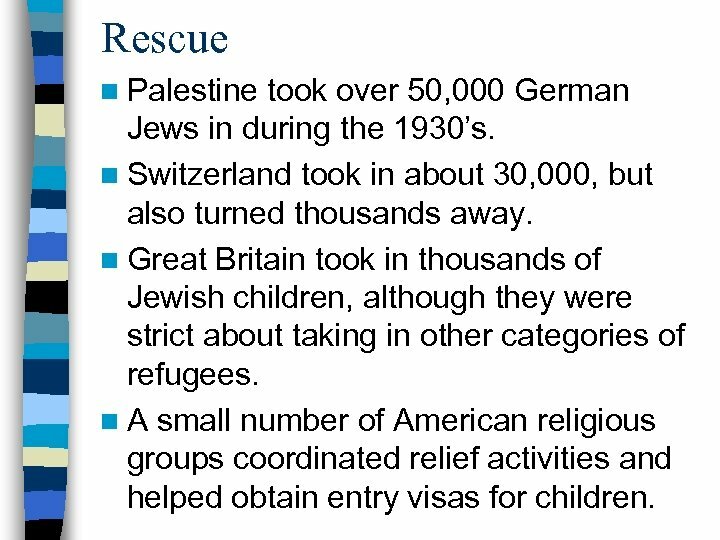 Rescue n Palestine took over 50, 000 German Jews in during the 1930’s. n Switzerland took in about 30, 000, but also turned thousands away. 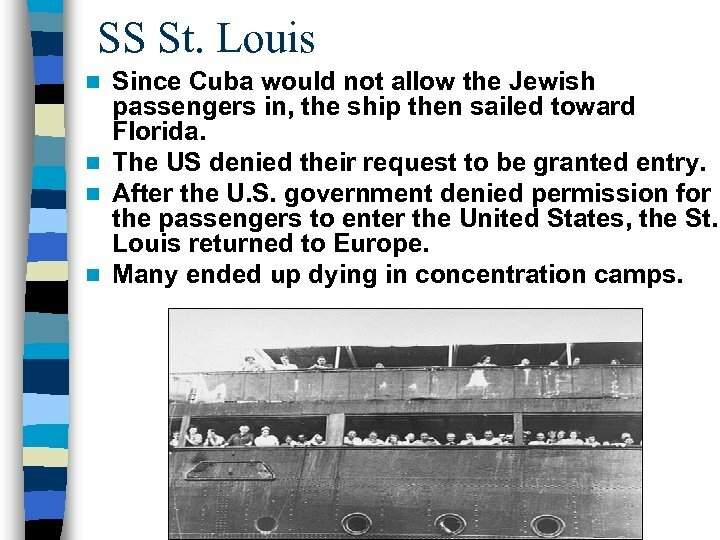 n Great Britain took in thousands of Jewish children, although they were strict about taking in other categories of refugees. n A small number of American religious groups coordinated relief activities and helped obtain entry visas for children. 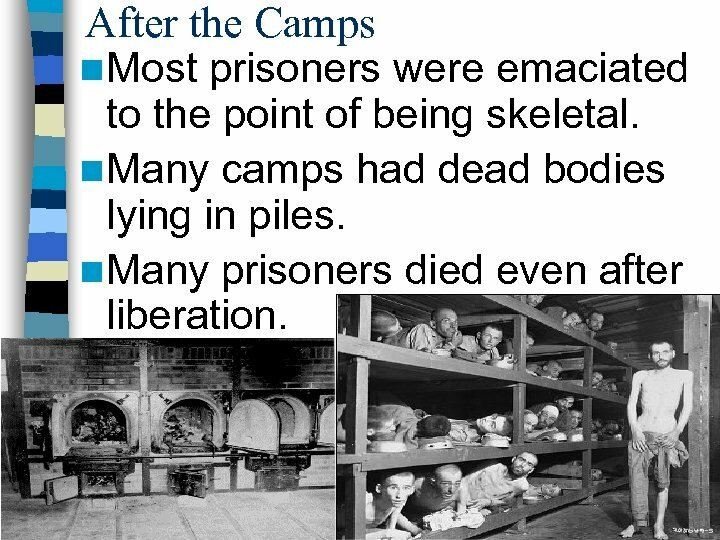 After the Camps n Most prisoners were emaciated to the point of being skeletal. n Many camps had dead bodies lying in piles. n Many prisoners died even after liberation. 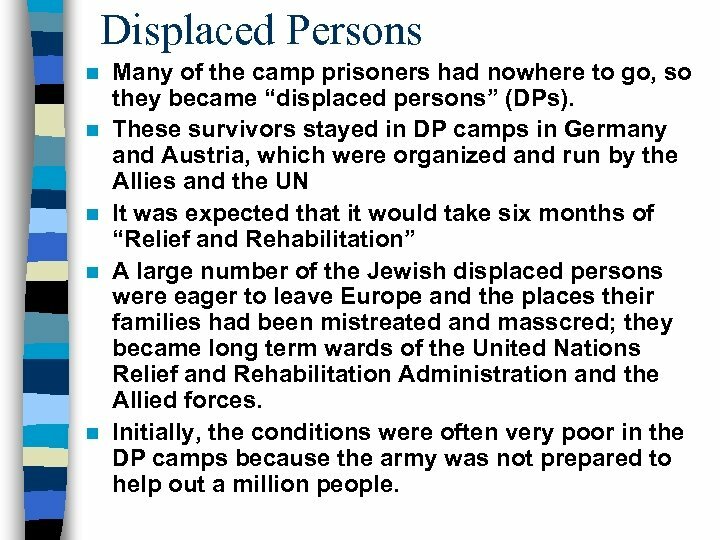 Displaced Persons n n n Many of the camp prisoners had nowhere to go, so they became “displaced persons” (DPs). These survivors stayed in DP camps in Germany and Austria, which were organized and run by the Allies and the UN It was expected that it would take six months of “Relief and Rehabilitation” A large number of the Jewish displaced persons were eager to leave Europe and the places their families had been mistreated and masscred; they became long term wards of the United Nations Relief and Rehabilitation Administration and the Allied forces. Initially, the conditions were often very poor in the DP camps because the army was not prepared to help out a million people. 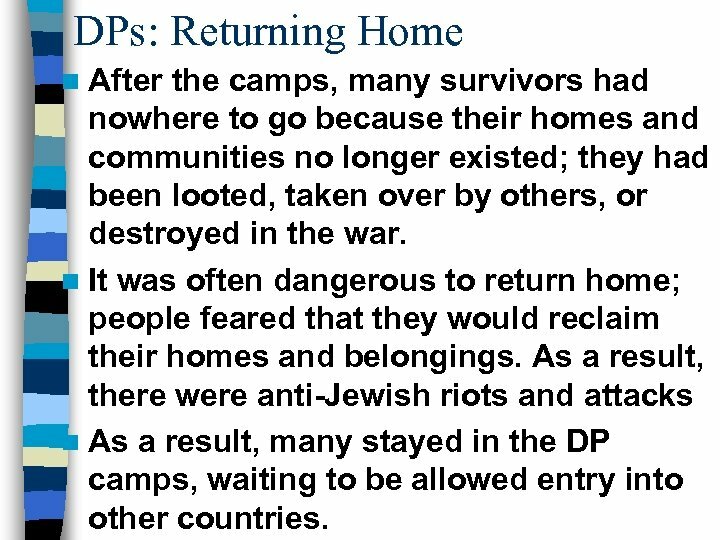 DPs: Returning Home n After the camps, many survivors had nowhere to go because their homes and communities no longer existed; they had been looted, taken over by others, or destroyed in the war. n It was often dangerous to return home; people feared that they would reclaim their homes and belongings. 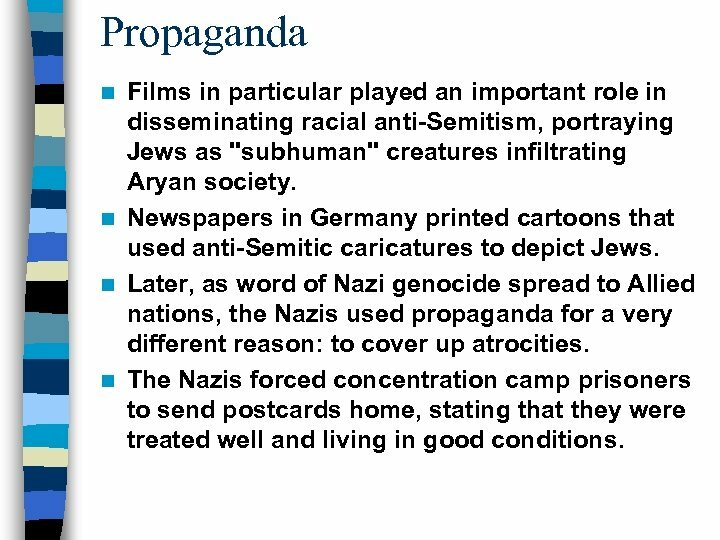 As a result, there were anti-Jewish riots and attacks n As a result, many stayed in the DP camps, waiting to be allowed entry into other countries. 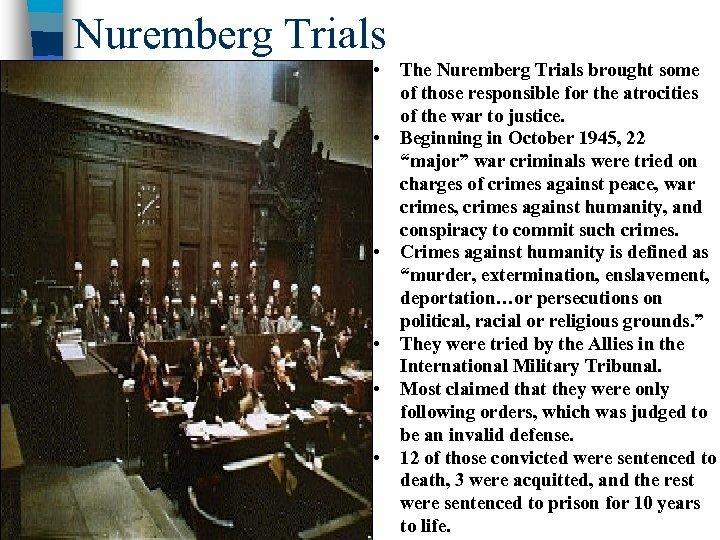 Nuremberg Trials • • n • • The Nuremberg Trials brought some of those responsible for the atrocities of the war to justice. Beginning in October 1945, 22 “major” war criminals were tried on charges of crimes against peace, war crimes, crimes against humanity, and conspiracy to commit such crimes. Crimes against humanity is defined as “murder, extermination, enslavement, deportation…or persecutions on political, racial or religious grounds. ” They were tried by the Allies in the International Military Tribunal. 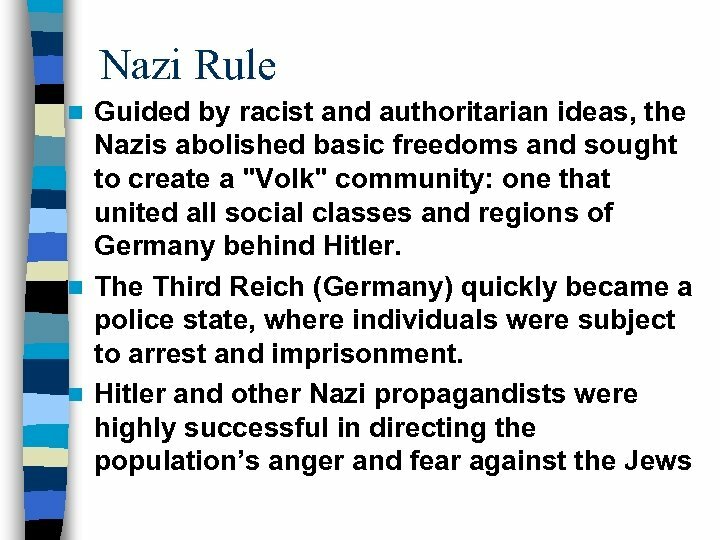 Most claimed that they were only following orders, which was judged to be an invalid defense. 12 of those convicted were sentenced to death, 3 were acquitted, and the rest were sentenced to prison for 10 years to life. 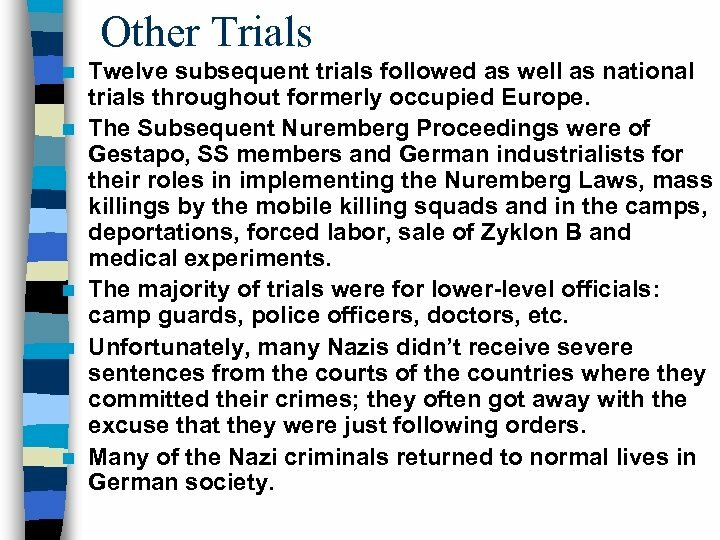 Other Trials n n n Twelve subsequent trials followed as well as national trials throughout formerly occupied Europe. 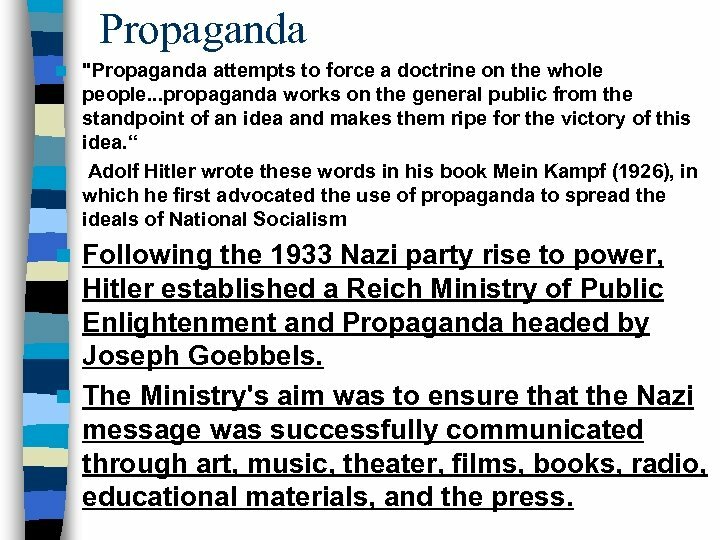 The Subsequent Nuremberg Proceedings were of Gestapo, SS members and German industrialists for their roles in implementing the Nuremberg Laws, mass killings by the mobile killing squads and in the camps, deportations, forced labor, sale of Zyklon B and medical experiments. The majority of trials were for lower-level officials: camp guards, police officers, doctors, etc. 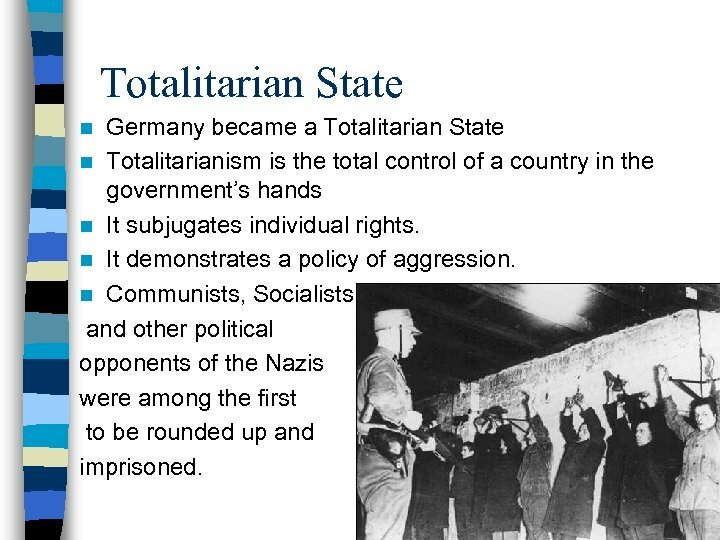 Unfortunately, many Nazis didn’t receive severe sentences from the courts of the countries where they committed their crimes; they often got away with the excuse that they were just following orders. Many of the Nazi criminals returned to normal lives in German society. Search for the Perpetrators n n n After the postwar trials, there was a continued search for perpetrators who had gotten away. Adolf Eichmann fled to Argentina and hid there until 1960 when he was captured; Israel had been searching for him for ten years. They sentenced him to death. 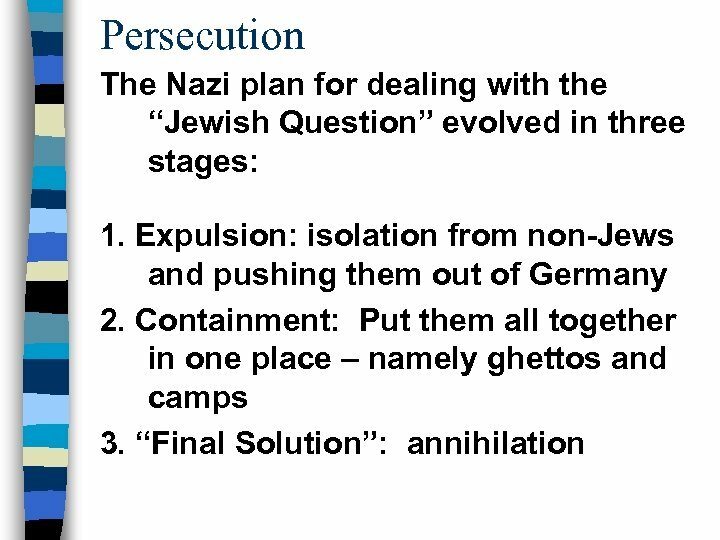 Nazi Hunter Simon Wiesenthal helped to locate Fraz Stangle, Gustav Wagner, Franz Muerer and Karl Silberbauer, all who were involved in the camps, ghettos, and arrests of Jews. 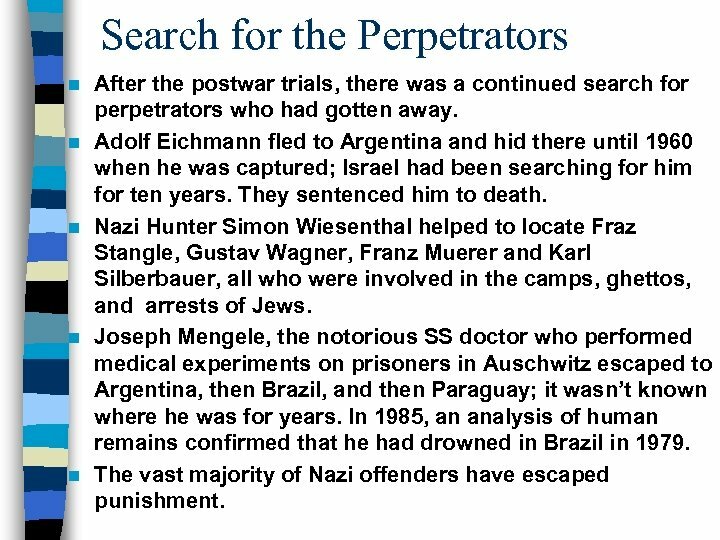 Joseph Mengele, the notorious SS doctor who performed medical experiments on prisoners in Auschwitz escaped to Argentina, then Brazil, and then Paraguay; it wasn’t known where he was for years. In 1985, an analysis of human remains confirmed that he had drowned in Brazil in 1979. The vast majority of Nazi offenders have escaped punishment. 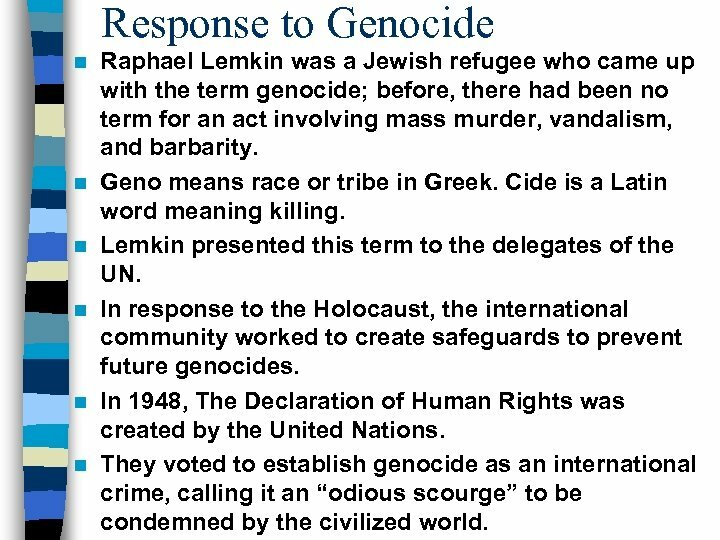 Response to Genocide n n n Raphael Lemkin was a Jewish refugee who came up with the term genocide; before, there had been no term for an act involving mass murder, vandalism, and barbarity. Geno means race or tribe in Greek. Cide is a Latin word meaning killing. Lemkin presented this term to the delegates of the UN. 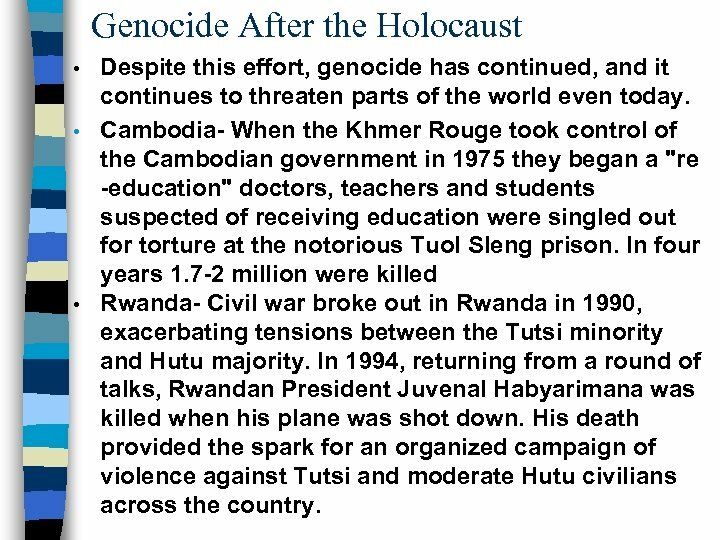 In response to the Holocaust, the international community worked to create safeguards to prevent future genocides. In 1948, The Declaration of Human Rights was created by the United Nations. They voted to establish genocide as an international crime, calling it an “odious scourge” to be condemned by the civilized world.